Caterpillar Local Host Plants: Centotheca lappacea (Poaceae, common name: Sefa), Lophatherum gracile (Poaceae). The adults are small and the 3rd segment of the palpi is long and thin. 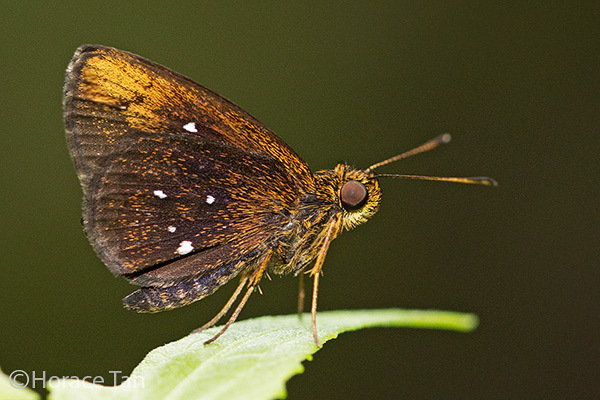 On the upperside, both sexes are dark brown. The male is unmarked but the female has several white post-discal spots on the forewing. On the underside, the wings are brown to dark brown overlaid with ochreous scales. 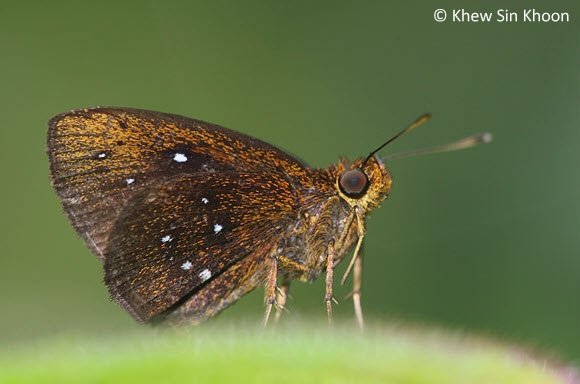 The apical area of the forewing is yellowish to yellowish brown. There are variable number of silvery spots on both wings. 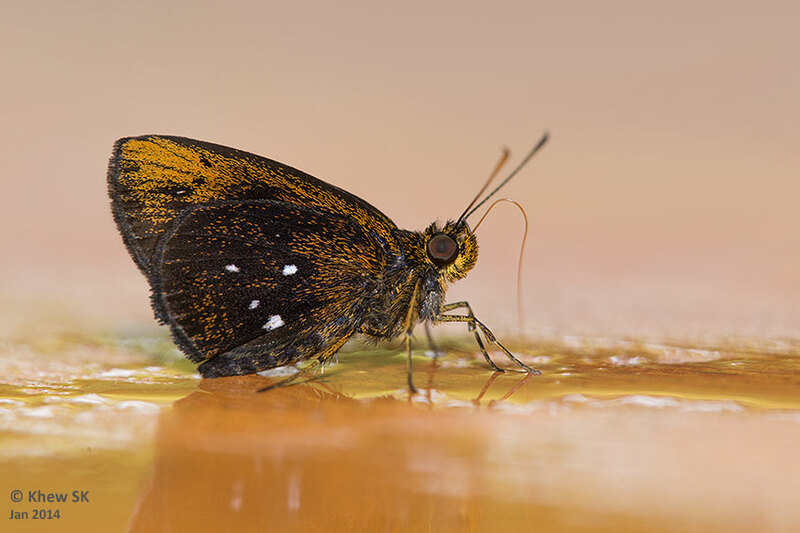 In fully-spotted specimens, the forewing features post-discal spots in spaces 2-5 and one spot near cell-end, and the hindwing features post-discal spots in spaces 1b, 2, 5 and 7, and one spot near cell-end. Noteworthy is that the spot in space 5 on the hindwing lies further out and about half way between cell-end and the wing margin. In the look alike species Iambrix salsala (Starry Bob), this spot lies just beyond the cell. 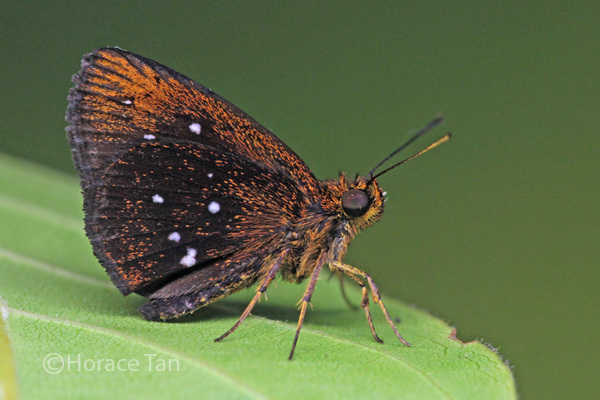 Starry Bob is moderately rare in Singapore and is typically found in forested ares in the nature reserves and western wastelands. 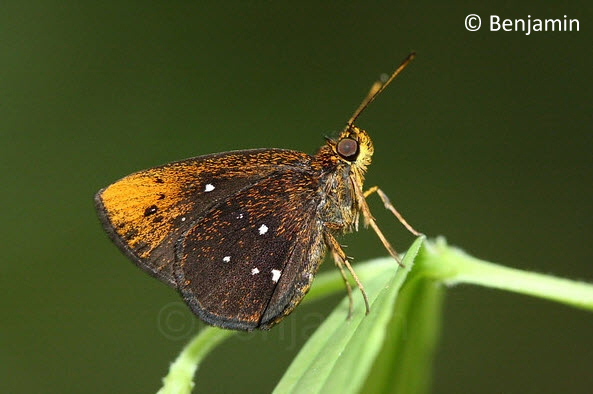 Within the nature reserve, the adults are usually sighted when they are feeding on flowers of Leea indica in the company of other skippers such as the Yellow Vein Lancer. 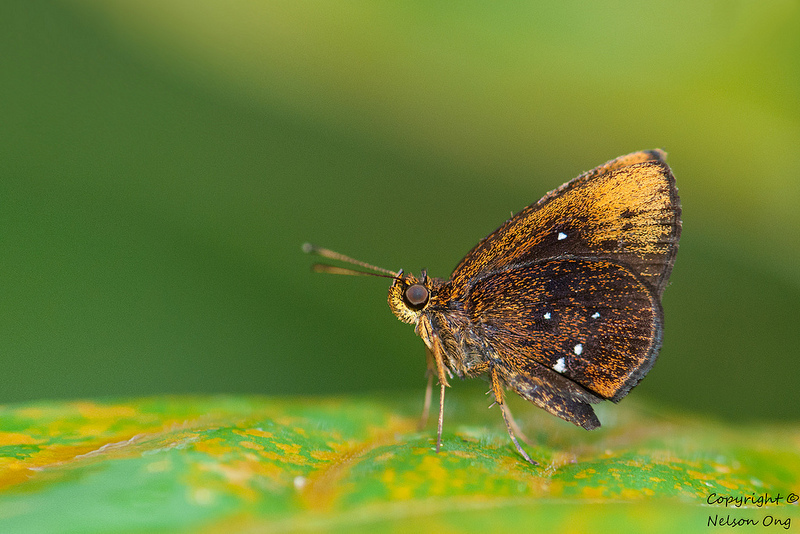 The adults tend to perch in shady foliage and are rarely sighted puddling on wet ground or organic waste matter.